Important: You can be assigned any combination of these permissions. If you are granted both 'send as' and 'send on-behalf' of permissions, 'send-as' permissions will be actioned. For a complete definition of these permissions, see: Full Mailbox, Send as, and Send on-behalf of. Select the account you want to manage. If you do not see the account you want to manage or are placed into your NetID account, review the following document: Wisc Account Administration site - Logging in. Existing Permissions: This table will show all users who have been granted full mailbox, send as, or send on-behalf of permissions. Important: you will also have the ability to repair existing permissions by using the "Permission Repair Tool" link. 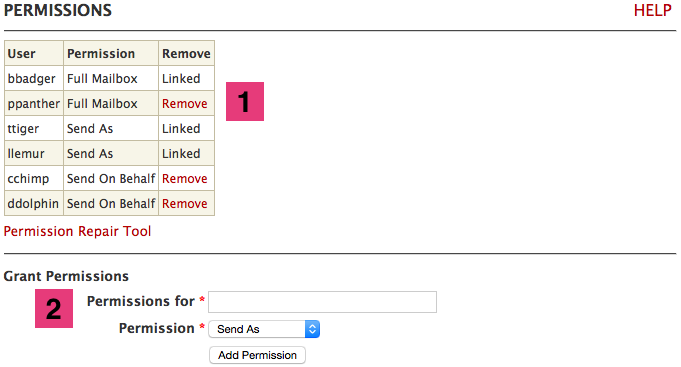 Grant Permissions: Allows you to assign full mailbox, send as, or send on-behalf of permissions. "Send on Behalf" of permissions can only be granted to one person at a time. If you have granted User A this permission and you then grant User B this permission, then User A will no longer have this permission. "Send on Behalf" of permissions cannot be repaired. You must remove and add this permission. Permissions for linked accounts cannot be managed within this menu; Linked accounts will appear within this menu without the option to remove the permissions. You must use these instructions instead to manage linked accounts. Permissions For: enter the email address of the individual you want to add the permissions for. Must be an Office 365 email address. Permission: select the desired permission. Important: This action may take up to 60 minutes to fully complete within Office 365 and may require the person who was granted these permissions to log out and log back into the client they are using. In addition, an automatically generated email will be delivered to you and the account you assigned these permissions. Note: if the process is unsuccessful or an error occurs, please contact the DoIT Help Desk. Within the "Permissions" screen, click Remove next to the account you want to remove the permissions from. If successful, it may take up to 60 minutes to fully complete within Office 365. If the process is unsuccessful or an error occurs, please contact the DoIT Help Desk. Within the "Permissions" screen, click Permission Repair Tool located under the permissions table. Click the Validate Permissions button. Please be patient for this process to complete. If inconsistencies are found, click on the desired action: Reapply or Remove. Note: when this action is completed, the account will be removed from the list. You may be wondering what the difference is between the Send as Addresses tool and the 'send as' permissions mentioned on this page. The difference comes down to what accounts are able to be added as send as addresses. On the this page, users must be in Office 365 and can only add other Office 365 accounts because that page adds an Office 365 specific permission from one account to another. What this means is that users can add external email addresses here (e.g. Gmail).